I’ll be the first to admit: I’m no beauty buff. In fact, I’m pretty clueless when it come to most of it: skincare intimidates me. I cannot whip together a winged cateye to save my life. And my idea of a successful Sephora trip is one where I don’t have to ask several store associates what exactly something is (which is usually followed by a fun raised eyebrow in disbelief because I must be the last person on earth who hasn’t heard of Kevin Aucoin’s sculpting powder). What can I say? 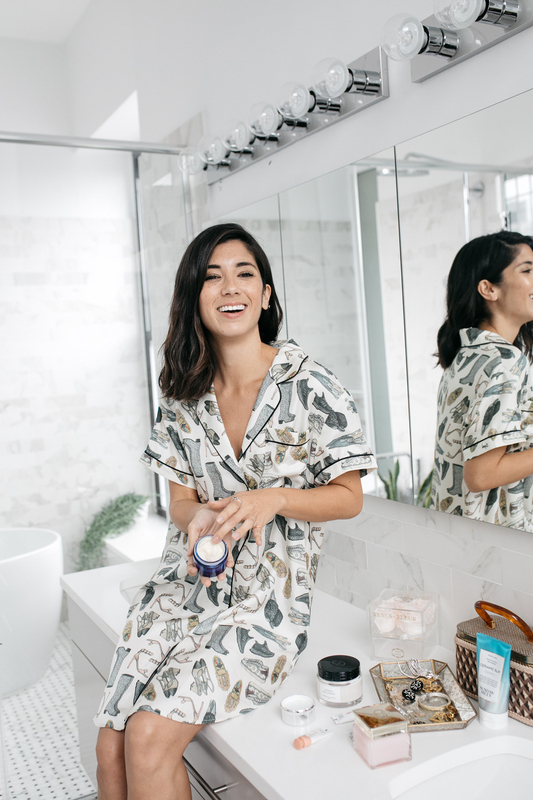 As much as I love all the bells and whistles when it comes to decking out my closet, my beauty routine is pretty simple. Minimal really. I like to keep things easy, classic and with little to no fuss. I have plenty of friends who are major beauty buffs (Helena, Grace and Lydia, I’m looking at you), so I turn to them when I really need advice, otherwise I keep an orderly ship, adding in a few new pieces here and there, only when it’s needed, or when any of the three aforementioned ladies RAVE about something. All of this is to say: I’ve found a few new favorites who have made their way into my edited lineup and I just had to share! Granted, none of these are new really, and some of you may already be using them, but I just wanted to share in case you’re like me, and it takes you a while to jump on board with certain beauty buzz products. Dior Jasmin Des Anges Body Cream: Now that winter is in full swing, I’ve been lathering this body cream all over after I dry off from my shower. It’s thick, so a little goes a long way — and the scent is divine. It’s become my new favorite winter ritual. 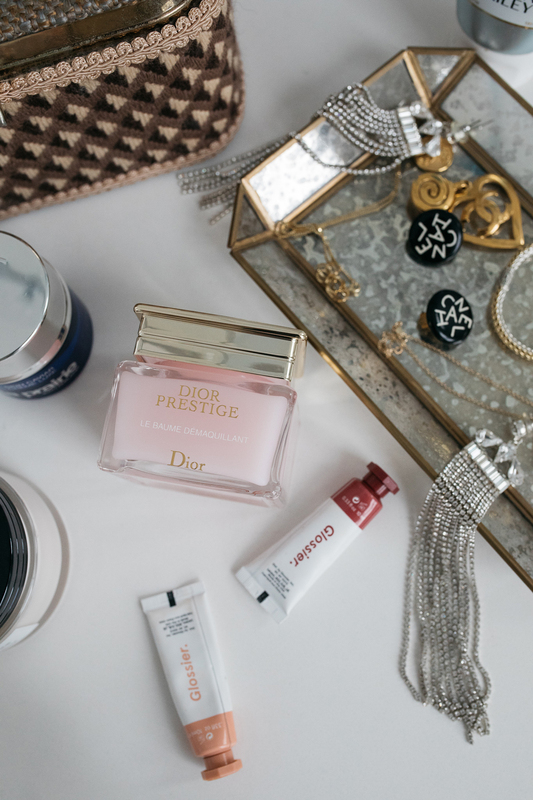 Dior Le Baume Demaquillant Rose Cleansing Oil-Balm: I’ve recently started double cleansing (after chatting with Helena about it) and I’m hooked. Plus, I’m kind of amazed (read: disgusted) by how much makeup stays on your face after just one wash! 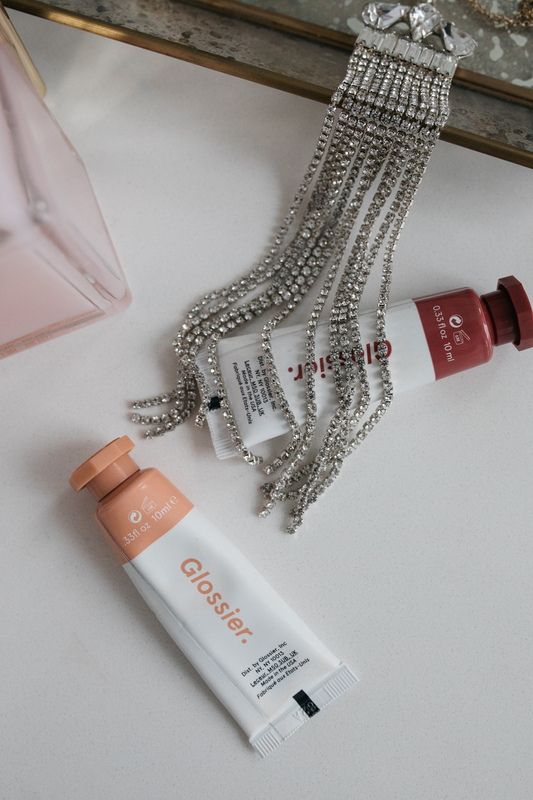 I start with an oil-based cleanser, to really help break down my makeup and I add just a tiny bit of water to work in the product with my hands, until it emulsifies a bit. 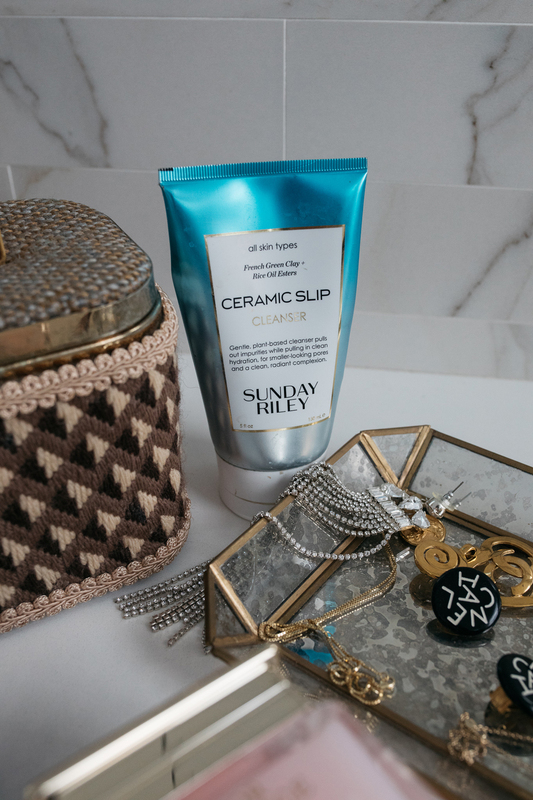 Sunday Riley Ceramic Slip Cleanser: Next, I’ll take a more water-based cleanser like my new favorite by Sunday Riley and work it in with a bit of water and a white washcloth, to ensure I really get everything off. I’m a huge fan of everything that Sunday Riley comes out with and this cleanser is no exception. Glossier Cloudpaint in “Dusk” and “Storm”: Truth be told, I was influenced to make this purchase, by my friend Tara, who just happens to have the perfect full blush look down to a science. I’ve always admired her flushed cheeks in her beauty tutorials and finally decided to try out these Cloud Paint dolors myself. I wear “Dusk” during the day for a more natural look and “Storm” in the evening for a bit more drama. 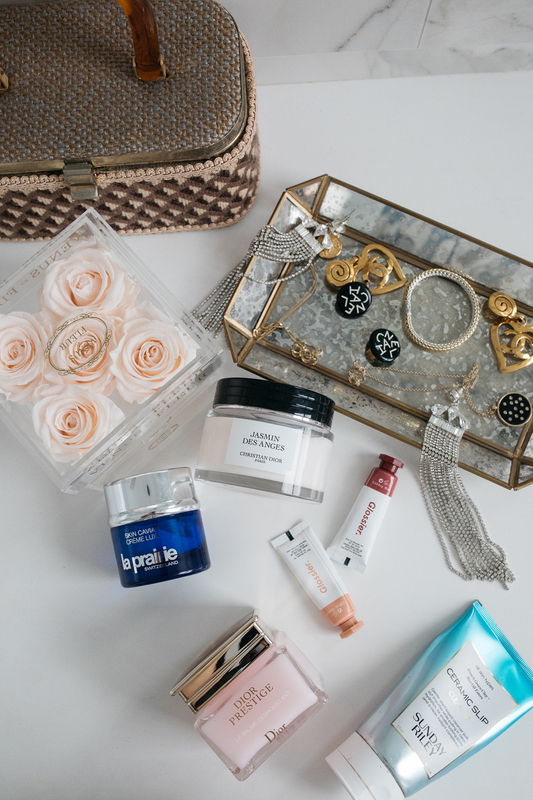 La Prairie Skin Caviar Luxe Cream: So I know this one comes with a hefty price tag. And if I didn’t receive free samples at an event that I attended, I would certainly be on the fence about purchasing it myself. The only issue now is I’m hooked on it, especially for these winter months when my skin needs an extra oomph of moisture. I apply this at night, after cleansing and make sure to use only a small amount — it goes a long way! It’s an extremely thick cream but it absorbs amazingly well and I always notice how full/plump my skin looks the next morning. I’m halfway through this canister and will definitely be purchasing once I’m out. Charlotte Tilbury Hollywood Flawless Filter in Light/Medium: OMG. I just have to say, I don’t know why I waited so long to try this one out! Both my friends Grace and Blair have raved about this filter and now I know why. This iridescent liquid makeup can be applied one of two ways. Either blended with foundation for an all over dewy, glowy look or as a spot highlighter (which is what I tend to go with). It catches the light so beautifully, especially for photos and it’s definitely making me reconsider my powder-based highlighter, which can look clumped in comparison. How about you guys? Any new beauty favorites you’d like to share? Style and beauty, beauty favorites, skincare. Oh the hollywood flawless filter is SO SO SO SO good! I have been using it literally since the day it came out in shops!